If you have a compatible device, you can also use our new app, Libby, to send borrowed ebooks to Kindle. Learn more about Libby here. If you're using a Fire tablet, please refer to our guide on getting started with the OverDrive app. Open your library's digital collection (you can find it using www.overdrive.com). Find a Kindle Book to borrow. 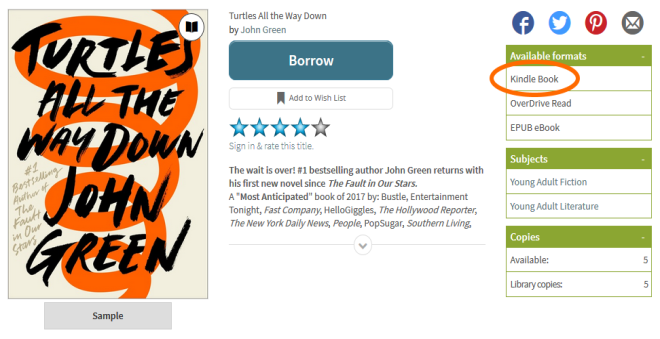 You can see all of your library's Kindle Books by selecting the Kindle Books link near the top of the site (or under on mobile devices). 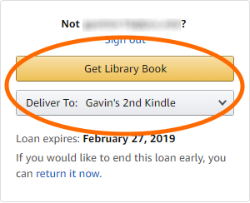 Note: You may want to check whether a Kindle Book has any device restrictions before you borrow it (this is most common for picture books, read-alongs, and graphic novels). Choose a lending period for the title (if available).Then, select Borrow again. You'll be taken to Amazon's website to finish getting the ebook. Note: You must complete this step for the book you borrowed to appear in the "Your Content and Devices" list in your Amazon account. If the book doesn't appear in this list, you won't be able to download it on any device. 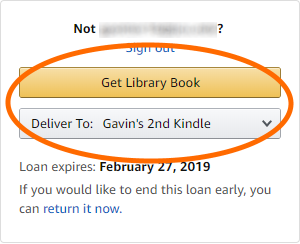 If you're signed into your Amazon account, verify the "Deliver to:" device and select Get Library Book. If you're not signed into your Amazon account, select Get Library Book, and sign in. Your Kindle ereader needs a Wi-Fi connection to download library Kindle Books from Amazon. If you don't have a Wi-Fi connection, you'll need to transfer the title via USB. Once a book is on your Kindle device or reading app, you can read it just like any other Kindle Book. For specific help reading on your device (like how to change the font or save a bookmark), visit Amazon Device Support. Note: Some Kindle Books from your library (including many picture books, read-alongs, and graphic novels) are not supported on certain Kindle devices or reading apps. 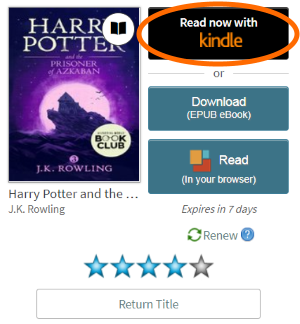 To check if an ebook has Kindle device or app restrictions, look for a Device restrictions link under "Available formats." Run a search or open a collection, then select Kindle Book under the "Format" filter. Use the advanced search and choose Kindle Book in the "All formats" drop-down menu. Once you find an available Kindle Book, select Borrow. 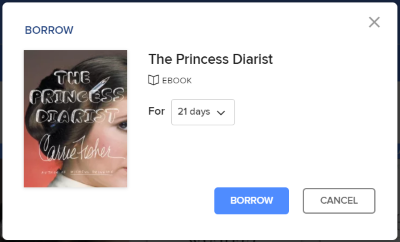 Find the ebook you've borrowed on your Checkouts page (under your Account). From there, select Read now with Kindle. 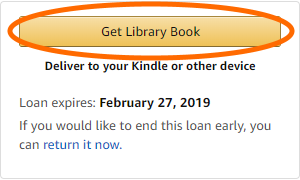 Note: You must complete this step for the book you borrowed to appear in the "Your Content and Devices" list in your Amazon account. If the library book doesn't appear in this list, you won't be able to download it on any device. If you're already signed into your Amazon account, verify the "Deliver to:" device and select Get Library Book.